Private, luxury cabins in the midst of the Beartooth Absaroka mountain range. Located off the beaten path on a quiet, country road. Each cabin is unique and separated from the others for complete unobstructed views of the mountains. The cabins are lavishly furnished with log, King or Queen size feather beds or cushy pillow-tops with cozy comforters. You can soak in a whirlpool tub or enjoy a romantic, two-person shower with soothing body sprays. Delicious breakfast foods are stocked in the full kitchens and a toasty, gas stove provides added warmth on a chilly night. Our private pond offers fishing and kayaking in the summer or ice fishing and ice skating in the winter. Try snow-shoeing or cross-country skiing through the nearby National Forest or just relax with a good book on the expansive deck of the cabin. No street lights, no street sounds only a mooing cow or a whinnying horse, possibly an Elk bugle or a grunting porcupine. You'll be amazed at what you don't hear! 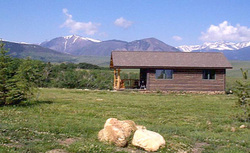 For prices and more pictures of the cabins, please go to our web site at www.blueskycabins.com. ""Cabin fever never felt so good!"" Directions: Blue Sky Cabins is located off the beaten path on a quiet country road in a small town called Luther. We are about 19 miles from Red Lodge off Montana Highway 78, 6 miles from Roscoe and 20 miles from Absarokee.